I'm going to deviate slightly this week for the How To. This week's version is going to be based off of a reflection paper I wrote during my senior year of college. The topic for the paper was to write something about ourselves. I wrote about my experiences playing high school football based off of the theme "10 Reasons to be an Eagle." In the future, I don't really plan on "recycling" old school papers for this blog, however, the individual that assigned this paper to me pulled me aside after he graded them and told me it was one of the best papers a student had submitted to him in over 40+ years of teaching. So after considering those accolades, I said what the heck. I am a strong believer in the idea that personal experiences make up a good portion of what kind of person an individual becomes. Experiences can consist of anything from family, education systems, friendships, different groups or teams one participates in, relationships, and even tragic events. All of these instances give a person a choice on how to react to these experiences, and more often than not, their reactions show just what kind of a person they are. Experiences shape the morals we have. They give us insight on what we stand for as an individual. These develop our general principles and beliefs. They enhance our personality and attitudes. They reveal our strengths and weaknesses. They give us a glimpse of where our life is going. They show us that change in our life can be good, even though, “people want things to stay the same and they think the change will be bad,” (Johnson 96). In my life, I have gone through a fair share of events and experiences that in one way or another have shaped the person I am today. For this paper, I will focus on a four-year long experience I lived in relation to how it molded me into what kind of a person I am. 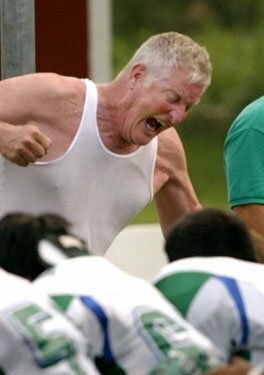 This experience was the time I spent playing football at Chaminade-Julienne under Head Coach Jim Place. I am 100% positive that what I learned during this time has laid the foundation for what kind of a person I am today, as well as how I will live out the rest of my life. Each season during two-a-days, we would go through two grueling practices for ten days. At the end of the second practice each day, we would all gather around Coach Place. All of us would immediately give him our attention—silent and looking right into his eyes. He would then give us one of his “Ten Reasons to be an Eagle” for the day. Reason # 1: Self-Esteem – Feeling of Self-Accomplishment. “Self-esteem is essential for psychological survival,” (McKay 1). Playing football made me feel good about myself. It significantly increased my self-esteem. I feel that it is so important that every person should like the person that they are and to be happy and feel good. Considering all of the reasons Coach Place gave us, I think there is a purpose he had this as the number one reason. That is because self-esteem is something that everyone should have a good sense of throughout his or her life, and I certainly have. “You are at peace with yourself, at peace with others,” (McKay 104). It is something that I have carried with me off the football field and into my life in college. My self-esteem is something I will carry with me throughout life too. Having a high self-esteem rubs off on others, and it is obvious as to how high someone’s self-esteem is based on their actions, personality, and attitude. While it is impossible to be happy all the time, and that there are times that I get down on myself, I have learned that having a high self esteem is very important to me, and the lessons Place taught us about self-esteem and having a feeling of self-accomplishment throughout our lives is an important lesson I learned. Reason # 2: Being Part of a Team. Participating in a group or team is something that everyone will have to do at some point in their life, regardless of if it is sports related or not. In the business world, teams are the norm. Being on a team gives you a sense of identity and allows you to participate, assume a role, set goals and objectives, and to go out and achieve those obstacles. “Your attitude determines the team's attitude,” (Maxwell 114). Having the experience of being on a team, especially the football team, showed me a lot about what kind of person I am. It allowed me to realize that I am a leader and have leadership qualities. My qualities showed me that “proof of leadership is found in the followers,” (Branden 49). My senior year I was one of the captains of the team. This meant that I had to be a role model. I had a sense of responsibility for everyone. “When teammates can’t make it, you carry them the rest of the way,” (Maxwell 126). I often had to carry teammates on my shoulders. Being part of a team first showed me that I contained these leadership characteristics, which not a lot of people possess, and it encouraged me to use these talents and abilities in everything that I do. I was able to almost on a daily basis positively influence my teammates and set an example for them to follow. I led my example, and my teammates had trust in me. “Trust is the foundation of leadership,” (Briggs 13). Reason # 3: Pride and Tradition. Playing football for C-J carries a lot of pride and tradition in the experience. We always talked about those that came before us, how they went through the same thing we were going through, that they bled on the field just like us, that they loved the game just like us, and so on. Coach Place put a great deal of importance on how important pride and tradition is in our lives. Pride is a very important element in my life. I take pride in almost everything I do. I do not ever do something that I would not want to claim as mine. I believe people should have a strong sense of pride, not to the sense that they are egotistical, but that they care and have a passion about something. Pride is a reflection of “what you're capable of doing with your particular gifts and talents,” (Kouzes 6). I carried a great sense of pride playing football. It was important to me, I took it seriously, I did the best on and off the field that I could as an athlete, and I look back at the experience with a sense of pride. I am proud of a lot of my accomplishment; it links with my self-esteem, and makes me feel good as an individual. Reason # 4: Learning Experience: Everyone is Equal, Manhood, Getting Knocked Down. The game of football, like life, is a learning experience. The things I learned playing football about life is incredible. It is not just about going to practice, learning your position, figuring out the rules and how to play…there is a personal element involved. Football taught me that everyone on the team was equal. Granted some people were more gifted athletes than others were, but this did not guarantee them a starting position. Everyone on the team is family. We were all brothers. Off the field, we were best friends. No matter who played and who was better than who, we were all equal as people. This was a great lesson I learned, and I still practice this idea to this day. Another learning experience from this reason is manhood. High school is a time where I did a lot of growing up, on and off the field. Part of stepping into manhood for me at the time was maturing, assuming more responsibilities, enduring pain and stress, and trying to balance and survive it all. Manhood, as it relates to me as a leader, also means not cutting corners or cheating yourself. “I learned firsthand that when it comes to leadership, you just can't take shortcuts, no matter how long you've been leading your people,” (Burns 55). In the game of football, there would be times I would get knocked down. And what would I do? I would get back up. The same is applicable to my life. Life is all about learning experiences, and sometime we are knocked down. The way I handle those times, and how fast I get up, often says a lot about my character. I am the type of person that gets right back up after being knocked down, no matter how bad it hurts. What good is there in lying down? I do not like sympathy. I do not ever feel sorry for myself. It is just how I am. Life is going to throw me some curve balls. I may want to lie down and not get up. However, it will not do me any good. I have to get back up, endure the pain, and keep playing the game. Reason # 5: Make People Proud of You: Family, Friends, and Girls. I place a good deal of importance on this reason. For me, there are few greater rewards than making my parents or loved ones proud of me. It is such a good feeling to know they feel that way. Looking up in the stands and seeing my parents watching me perform with their facing glowing is a memory I will never forget. It keeps me motivated to continue to be successful so that I can keep on giving them this pleasure. Through my achievements on the field, in the classroom, and other aspects of my life, I have succeeded and given my parents something to be proud of me for. That in turn makes them feel good about raising a good son. All around it is a good thing. Having someone that is proud of me makes me feel good about myself. It gives me something else to live for. Making girls proud of me has had its benefits as well, but that is a completely different story. Reason # 6: General Principles. Of all the reasons Coach Place gave us, this is the one I remember and try to live out and apply to my life the most. General principles, or G.P.s as he calls them, are what you stand for as a man. They are your morals, attitudes, and how you feel about something. It is about doing the right thing. It is about setting a good example for others to follow. Coach Place always uses a scenario to stress this point. He asks us what we would do if we saw someone that was handicapped or mentally retarded, and how would we treat them. Would we point and laugh at them with our friends? If so, that is not having good G.P.s. I rather relate them to the whole WWJD idea. I honestly think about Coach Place’s G.P.s almost every time I make a decision. I have so much respect for him that I ask myself if he would approve of a choice I made. I would consider myself to have high general principles. “No man can climb out beyond the limitations of his own character,” (Larson 56). I am respectful, honest, trustworthy, loyal, hard working, sincere, and open. Having a good sense of general principles has shaped a lot of the person that I am, the choices that I make, the type of people I surround myself with, how I respond in different relationships, and how I live day to day. Reason # 7: Physical Conditioning. Football put me in the greatest shape of my life. It stressed the importance of being fit and working out. Being in shape made me feel happy and healthy. I felt good about myself after a hard workout or practice. In addition, it allowed me to perform to the best of my ability. I carry on the physical conditioning habits of football in my life today. I love working out. Being physically fit is an important part of my life and probably always will be. It also allowed me to take charge of myself and be a leader. “The higher you want to climb, the more you need leadership,” (2 Maxwell, 6). I continue to climb higher in life by challenging myself. I have taken the lessons Coach Place has shown me through his leadership and use them as motivation as I push myself harder and harder to succeed. Reason # 8: Love of the Game. One of the greatest reasons I played football was because I loved the game. Football allowed me to have fun at something I enjoyed, to push myself to the limit, to be competitive, and to experience the awe and excitement of winning and the disappointment of losing. Regardless, I had a passion for the game. Playing football for the love of the game told me a lot about myself. I have come to realize that if I put my mind to it, I am capable of achieving anything. Going into high school my first year, I never imagined that I would have a very successful career in football. By my senior year, I had achieved awards such as Athlete of the Week, Wendy’s National Heisman Athlete Nominee, Penn Station Athlete of the Month, Scholar Athlete of the Year, First Team All-League, as well as a variety of other awards. These types of honors tell me that anything is possible if I work hard and put my heart into it. Even if I find something to be difficult and out of the question, I think about my days playing football, and tell myself that if I really want to I can do it. I applied the same thing to playing the piano, and currently the bagpipes. I had no idea how to do either, but with lots of practice and hard work, I was able to play many difficult songs on the piano, and I am now applying the same strategy to learning the bagpipes. If I put my mind to it, I am confident I can do anything I want. I have always been a responsible, disciplined person. It is just part of my personality and how I was raised. “Only the right action at the right time will bring success,” (Parker 15). Being disciplined gives me an advantage on making these right actions. I was able to apply this to the football field, where discipline was enforced heavily. Having a strong sense of discipline has helped me out a lot in life. During football, I relied on it to get my life in order, as far as going to school, going to practice, doing my homework, getting enough rest, being responsible, etc. I had a set routine that I followed daily. Having gone through that experience, I have benefited in college and in the professional environment, where I need to use the same kind of discipline to keep my life in order. Discipline also means having a great deal of respect. Coach Place commanded it from his players. In return, I gave him it. “Intuitive leaders can sense what's happening among people and almost instantly know their hopes, fears, and concerns,” (Avery 81). Coach Place recognized that being a disciplined team would only benefit us individually as players. But I also have learned to be disciplined in other parts of my life other that football, such as showing respect for my parents, teachers, classmates, roommates, and co-workers and bosses as well. By staying close to these people, and showing them that I care, has proven to be beneficial in my life. “Everyone’s potential is determined by the people closest to them,” (MacMillian 138). Reason # 10: Friday Nights. In the high school football world, there is no greater time then Friday nights. Friday nights was my payday. It was my time to cash in on all the hard work I had been dedicating to the game all week long. I think that it is important to have events to look forward to in life. In high school, it was obviously Friday nights. In college, I look forward to the weekends because it is a time I get to relax from a hard week of school and work, hang out with my friends, and have a good time. I believe in the saying “Work hard, Play hard.” I work 40 hours a week and take 18 credit hours. That is more than most students at this university, not to mention the fact that I spend a ton of time on schoolwork and rugby as well. Rewarding myself for all of my hard work during the week is one of the things I love doing on the weekends. Later in life, I will remind myself that while I may be caught up with work and a family, it is also important to have fun at times and to enjoy the company of those around me. Playing football for Coach Place was truly a blessing for me. I loved practically every minute of it. I am so happy I was given the opportunity to play for him and to have four years to soak up as much wisdom and guidance from him as I possibly could. The game of football taught me a lot about life, and even more about myself as a person. It taught me life lessons and the importance of many things including: setting and having goals, keeping up my grades, living a drug-free lifestyle, caring about teammates and others, accepting criticism, being humble, the role of God in my life, showing respect for coaches, teachers, and parents, being brave enough to be masculine, and having the proper attitude towards not only winning on the field, but off the field as well. Playing the game, making friends, and learning from Coach Place all have significantly affected my life, and have made me a better person for having done so today. I learned so much about myself from the game through the different circumstances, pressures, demands, and emotions that football evoked. I keep these experiences in the back of my mind always, and build off them daily as I set out to be the best person I can possibly be.